Our Practice - DR. STEVEN M. KREIGER AND ASSOCIATES, INC.
Born is 1956 in Bridgeport, Connecticut, Dr. Kreiger graduated from Lehigh University in 1979. He then attended the New England College of Optometry until 1983. Residencies in contact lens, subnormal vision, children's vision and family eyecare were completed before graduation. Following graduation a residency in eye disease at the Pennsylvania College of Optometry, Philadelphia, was completed. 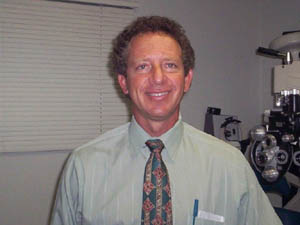 Dr. Kreiger then returned as a Clinical Instructor to the New England College of Optometry, while in private practice in Rhode Island, where he has been practicing optometry for 35 years. A variety of other volunteer and community service positions, including Rotary Club, Lions Club, Boys & Girls Club, Prevent Blindness, and various professional groups fill up his time, in addition to his wife of 30 years and two sons.... he is also very fond of kicking a soccer ball, and falling off his bicycle now and then..
Karyn is a native Rhode Islander who has been with the practice for several years. She puts enthusiasm and energy into every task, and you can easily see that yourself. Karyn's honest opinions, good nature, and sense of style in the optical dispensary will serve you well. Your satisfaction is our business! Becky has a wide range of experience in all parts of the vision care and has been with the practice for 12 years now. Insurance is her specialty, but there isn't a person out there that she couldn't teach how to insert a contact lens. She is sure to help you in a timely and effcient manner. Melba is our team dog. She shows up occasionally, usually on Wednesdays, but has a very busy schedule. You'll be lucky if you see her, and she loves to be scratched, so don't be shy. Also, although she is a water dog she hates water.. so please keep her away from the water cooler. Betty has worked in vision care for many years, and is familiar with a wide range of needs, most likely including yours!. Kind and friendly, she will gladly assist you and make you feel welcome in our office.